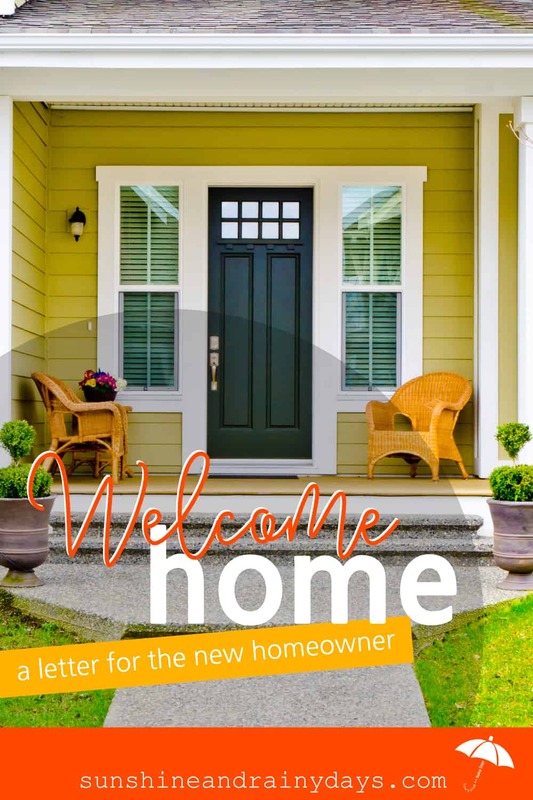 When you Sell Your House, a Welcome Home Letter To New Homeowners creates an extra step for you in the middle of one of the most stressful times of your life. However, the gesture will likely not go unnoticed and will certainly be appreciated by the new owner! We sold our home to people who we knew absolutely nothing about. We knew their names, only because names were on the paperwork we signed. It was weird! Weird that a new family would be moving into our home of 13 years and we hadn’t even met them. We had no clue if they had children, how old they were, what they looked like, nothing! You are probably thinking it doesn’t matter, right? To me, it mattered! I asked our realtor to find out a little about who was buying our home. She must not get this request often because she seemed a bit shocked. A few days later we got ‘they were married in Hawaii a year ago and have not started a family yet’. That was it! The home we had cared so meticulously for would have new owners and those owners would not know anything about the history of our home. Of course, the new owners had explored our home before making that initial offer but they didn’t know that the Christmas lights we left were cut to size specifically for the peaks of the home. They may have laughed at the little flip lock on the front door. The flagstone path we had so carefully laid would not be appreciated if the new owners didn’t know how we had built it. 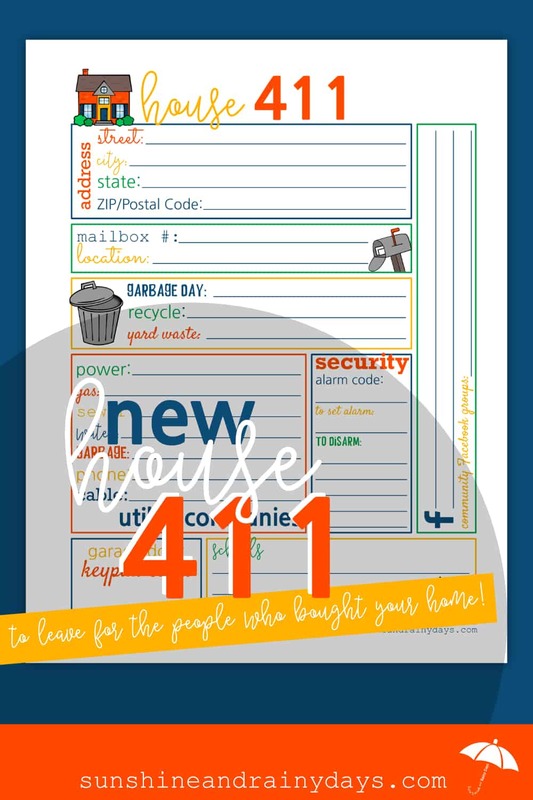 What about our mailbox number or the code to the garage door keypad? I was determined, and made it my mission, amongst the craziness of moving, to let the new owners know the history and important information about their new home. I also wanted to share about us, the family that had lived there! One tired night, I sat at my computer and wrote a letter to the new homeowners. There are many other things I could have and wished I would have said, however, I left good enough alone and left my letter on the island along with a poinsettia, keys, garage door openers, and mail! Welcome home John and Sally! This home is filled with much love and many memories! We hope you will enjoy it as much as we have! In 2003, an awesome family moved in and quickly made this house a home! Their daughter, Justine, was just three years old and their son, Jack, was one! They came up with extra money to have the builder upgrade to white doors and trim and to put cupboards above the washer and dryer. They also had extra outlets installed in the garage. Jayleen was quite the organizer and knew she wanted to install EasyClosets in every closet space so she asked the builder to not install the normal wire system so she could start with a fresh slate! 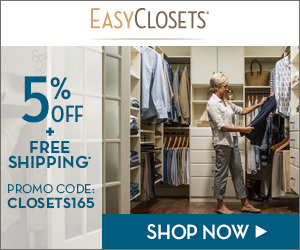 She and Blake measured and designed closets that would work for them, ordered, and installed them themselves. You will find many of the shelves to be interchangeable and will find extras here and there! Shortly after moving in, Jayleen and Blake discovered little Jack could easily let himself out the front door. One particular day, they decided to follow Jack to see just how far he would go. He made it a full two blocks while repeating over and over he was going to Abby’s house (one of his friends that lives close by). At least he was going the right direction! Needless to say, that’s when the flip lock was installed on the front door! That flip lock has stumped many visitors since! This hot family also had air conditioning installed which kept them cool throughout many summers! Then came garage organization! They installed the Onrax in the garage for extra storage, gladiator hooks for tools, and, what Jayleen liked to call, The Wall Of Wow for all the kids’ outdoor and sport equipment. You will also find a large hook in the center beam of the garage which was used at Birthday parties for pinatas! Eventually, the landscape became a focus and Jayleen and Blake hired a landscape designer to draw up plans. They purchased plants and planted the back hill. Next, they tackled the flagstone pathway to the side of the house being careful to dig, add just the right amount of gravel, and then sand before carefully placing each flagstone and the elfin thyme between them. The front hill was done much later by a landscaping company! Blake and Jayleen loved to garden and created a yard full of life! 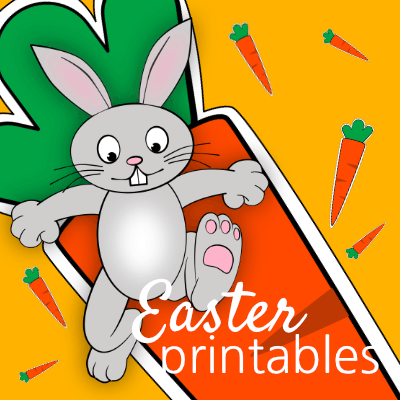 Frogs, butterflies, bees, and even bunnies were often seen and heard. Teddi Bear, their Shihtzu Bichon, absolutely loved chasing after the bunnies, and would get horribly dirty on the back hill, which is why they put up a barrier on the back hill. Blake and Jayleen built the cinder block raised garden beds and grew green beans, tomatoes, strawberries, onions, zucchini, lettuce, pie pumpkins, and potatoes. Potatoes aren’t too friendly with anything other than green beans so they were grown in the garden at the side of the house. One Black Friday, they upgraded to stainless steel appliances and boy, do they look good! Justine is now 16, and driving! She attends high school and plays the electric bass. Jack is now 14 and has always loved LEGOS, Star Wars, and playing the electric acoustic guitar. He also has a YouTube channel! Your new home has seen many Birthday parties, Christmas parties (even an ugly sweater one), sleepovers, laughter, music (did I mention Blake plays the drums? ), fun, and more Nerf wars than we can count! On the rare occasion we have snow, the road makes a perfect sled run! I can still hear the screams of joy when yet another snow day is called, another sleepover is planned, and sledding and hot chocolate were on the agenda! We trust and pray you will experience your own fun memories in this awesome home! Our Welcome Home Letter Was Appreciated! A friend and I had meticulously cleaned the house from top to bottom including blinds, baseboards, window seals, and doors. Every cupboard was wiped inside and out, the Easy Closets were wiped down, and the appliances were left sparkling! 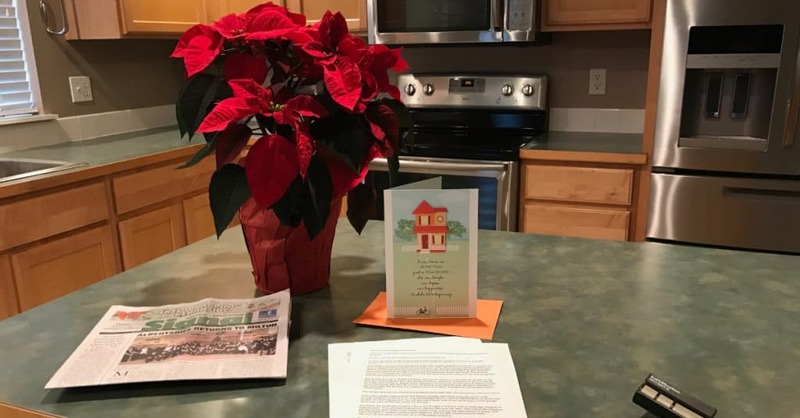 Blake gave the grass a fresh mow, we left a three-ring-binder with appliance manuals and the gas key in a drawer, and we topped it off with a poinsettia and this Welcome Home letter! The next day, our realtor called and told us the new homeowner’s realtor had called and wanted to be sure they thanked us. The realtor said he had been in this business for over 20 years and never had he seen a home left like this. Our realtor said, ‘whatever you did, they sure liked it’! 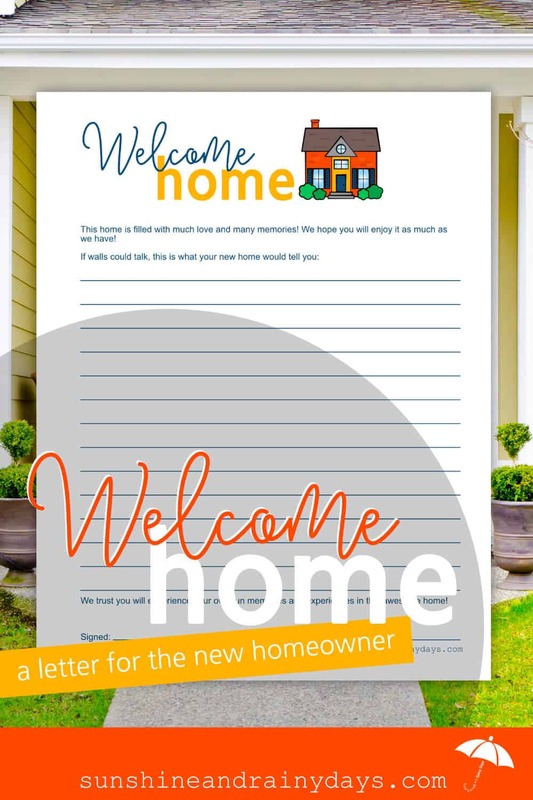 If you have a move on the horizon, I have created a Welcome Home Letter Printable just for you! Although the moving process was incredibly tiring, busy, and emotional, I found peace in knowing I had shared with the new owners a little of the history, information, and FUN we have had in the shell of a house we once called home! I LOVE the touch of the picture from 1890! How fun! That’s awesome you actually got to meet the new homeowner! It’s surprising to me how little you know about buyers. I was determined the new owners would know something about us whether they wanted to or not! Ha! Thank you for the nice letter idea.